Establishment of Suisun Valley Viticultural Area, Calif.
*1153 AGENCY: Bureau of Alcohol, Tobacco and Firearms, Treasury. SUMMARY: The Bureau of Alcohol, Tobacco and Firearms (ATF) is considering the establishment of a viticultural area in Solano County, California, to be known as “Suisun Valley.” This proposal is the result of a petition from Mr. Ben A. Volkhardt, president of the West Solano County Grape Growers Association. The establishment of viticultural areas and the subsequent use of viticultural area names in wine labeling and advertising will allow wineries to better designate the specific grape-growing area where their wines come from and will enable consumers to better identify wines they purchase. DATE: Written comments must be received by March 12, 1982. ADDRESS: Send written comments to: Chief, Regulations and Procedures Division, Bureau of Alcohol, Tobacco and Firearms, P.O. Box 385, Washington, DC 20044- 0385, (Attn: Notice No. 401). Copies of the petition, the proposed regulations, the appr opriate maps, and the written comments will be available for pub lic inspection during normal business hours at: ATF Reading Room , Office of Public Affairs and Disclosure, Room 4405, Federal Bu ilding, 12th and Pennsylvania Avenue, NW., Washington, DC. On August 23, 1978, ATF published Treasury Decision ATF-53 (43 FR 37672, 54624) revising regulations in 27 CFR Part 4. These regulations allow the establishment of definite viticultural areas. The regulations also allow the name of an approved viticultural area to be used as an appellation of origin on wine labels and in wine advertisements. On October 2, 1979, ATF published Treasury Decision ATF-60 (44 FR 56692) which added a new Part 9 to 27 CFR, for the listing of approved American viticultural areas. (e) A copy of the appropriate U.S.G.S. may with the boundaries prominently marked. ATF has received a petition from Mr. Ben A. Volkhardt, president of the West Solano County Grape Growers Association, proposing an area in Solano County, California, as a viticultural area to be known as “Suisun Valley.” The proposed area is located in the southwestern portion of the county adjacent to the Napa County line and east of Green Valley. Suisun Valley lies within the southern end of two ranges of the Coast Range, the Vaca Mountains on the east and the Mount George Range on the west. The valley terminates in the south at the marshlands of Suisun Bay. (a) The Suisun Valley grape area lies within the Coastal area climate and is characterized by cool, moist winds blowing inland from the ocean and bay almost continuously from May through early Fall. (b) The climate in Suisun Valley is mid-region III as classified by the University of California at Davis system of heat summation by degree-days. Over a 14-year period, the University of California weather station in mid- Suisun Valley averaged an accumulation of 3,368 degree-days. (c) The season totals for degree-days above 50 degrees Fahrenheit for upper Suisun Valley were 3,768.4 in 1973 and 3,700.5 in 1974. In mid-Suisun Valley the season totals were 3,460.4 in 1973 and 3,256.3 in 1974. In comparison, the season totals for Green Valley, which lies directly west of Suisun Valley, were 3,683.9 in 1973 and 3,498.2 in 1974. (d) Fog hardly ever penetrates into the Suisun Valley due to its distance from the Pacific Ocean. In contrast, fog is very prevalent in Green Valley due to its proximity to the ocean. (e) The soils in Suisun Valley consist of Brentwood clay loam, Sycamore silty clay loam, San Ysidro sandy loam and Rincon clay loam. (f) The watershed in Suisun Valley drains southward into the Suisun Bay. In the Vacaville-Dixon area, which lies to the east of Suisun Valley, the watershed drains eastward in to the Sacramento River. According to information provided by the petitioner, Suisun Valley is approximately three miles wide and eight miles long. Grapes have been grown commercially in Solona County since the late 1800’s. As early as 1909, over 2,000 acres were recorded by the *1154 Bureau of the Census. Since that time, a small but stable wine grape acreage has been continuously maintained. Currently, about 800 acres of grapes are under cultivation within the proposed area. Also, two wineries are operating within the area. The principal varieties of grapes grown in Solano County in decreasing order of acreage are: Gamay, Petite Sirah, Cabernet Sauvignon, Carignane, Zinfandel, French Columbard, Chenin Blanc, Early Burgundy, Gamay Beaujolais, and Gray Riesling. The petitioner claims that grapes from western Solano Conty have been well received by Napa-Solano County vintners, and growers have experienced no difficulty in meeting the minimum acid and sugar requrements for north-coast grapes. The boundaries of the proposed Suisun Valley viticultural area may be found on four U.S.G.S. 7.5 minute quadrangle maps (“Mt. George Quadrangle, California”, “Fairfield North Quadrangle, California”, “Fairfield South Quadrangle, California”, and “Cordelia Quadrangle, California”). The specific description of the boundaries of the proposed viticultural area is found in the proposed regulations. It has been determined that this proposal is not a “major rule” within the meaning of Executive Order 12291, 46 FR 13193 (February 17, 1981), because it will not have an annual effect on the economy of $100 million or more; it will not result in a major increase in costs or prices for consumers, individual industries, Federal, State, or local government agencies, or geographic regions; and it will not have significant adverse effects on competition, employment, investment, productivity, innovation, or on the ability of the United States-based enterprises to compete with foreign-based enterprises in domestic or export markets. The provisions of the Regulatory Flexibility Act relating to an initial and final regulatory flexibility analysis (5 U.S.C. 603, 604) are not expected to apply to this proposed rule because the proposal, if promulgated as a final rule, is not expected to have a significant economic impact on a substantial number of small entities. ATF has come to this tentative conclusion based on the fact that we do not have a way to assign a monetary value on the use of the name “Suisun Valley” as a viticultural area appellation of origin on wine labels and in wine advertisements. Since the benefits to be derived from using a new viticultural area appellation of origin are intangible, ATF cannot conclusively determine what the economic impact will be on the affected small entities in the area. However, from the information we currently have available on the proposed Suisun Valley viticultural area, ATF does not feel that the use of this appellation of origin will have a significant economic impact on a substantial number of small entities. ATF requests comments concerning this proposed viticultural area from all interested persons. Furthermore, while this document proposes possible boundaries for the Suisun Valley viticultural area, comments concerning other possible boundaries for this viticultural area will be given consideration. A notice of proposed rulemaking requesting public comment on a proposed Green Valley viticultural area, adjacent to the proposed Suisun Valley viticultural area, is being published in today’s Federal Register. ATF requests public comment regarding the geographic and climatic features, if any, which distinguish the two areas in order for ATF to decide whether there should be two separate areas or a single viticultural area established in these valleys. Comments received before the closing date will be carefully considered. Comments received after the closing date and too late for consideration will be treated as possible suggestions for future ATF action. ATF will not recognize any material or comments as confidential. Comments may be disclosed to the public. Any material which the commenter considers to be confidential or inappropriate for disclosure to the public should not be included in the comment. The name of the person submitting a comment is not exempt from disclosure. Any person who desires an opportunity to comment orally at a public hearing on these proposed regulations should submit his or her request, in writing, to the Director within the 60-day comment period. The request should include reasons why the commenter feels that a public hearing is necessary. The Director, however, reserves the right to determine, in light of all circumstances, whether a public hearing will be held. The principal author of this document is Robert L. White, Research and Regulations Branch, Bureau of Alcohol, Tobacco and Firearms. However, other personnel of the Bureau and of the Treasury Department have participated in the preparation of this document, both in matters of substance and style. (b) Approved maps. The appropriate maps for determining the boundaries for Suisun Valley viticultural area are four U.S.G.S. maps. They are titled. (b)(4) “Cordelia Quadrangle, California”, 7.5 minute series. (c)(6) Thence due south along range line “R3W/R2W” to the point of beginning. Assistant Secretary (Enforcement and Operations). 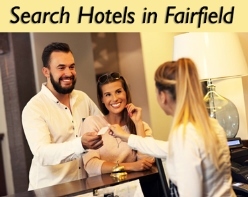 Book an overnight stay in Fairfield hotels here.